United Airlines planes parked at a terminal at O'Hare International Airport in Chicago. One year after a United Airlines passenger was violently dragged off a plane for refusing to be bumped, United and most other airlines have dramatically reduced their rates of bumping passengers from overbooked flights. An annual airline quality report card released Monday shows that airlines have improved in other areas of providing services, too, but the report's authors caution that does not mean commercial airline travel has dramatically improved in significant ways. One year ago, United suffered a public relations fiasco after passenger David Dao was dragged off a plane by security officers at Chicago's O'Hare International Airport. The officers were summoned when Dao refused to give up his seat on a flight to Louisville, Ky. Cellphone video of a bloodied Dao being dragged sparked public outrage worldwide. The annual Airline Quality Rating by researchers at Wichita State and Embry-Riddle Aeronautical universities shows that as a whole, the 12 largest U.S. airlines improved their performance last year in three of the four categories tracked. That makes 2017 the best year for overall airline quality in the 28 years of the report. "The industry is improving, but there are still a lot of frustrated travelers out there," says Brent Bowen, dean of aviation at Embry-Riddle Aeronautical University and one of the report's lead authors. Bowen and other researchers cite increases in flight delays, the only category in which the airlines performed worse last year, and other frustrations that are not measured in this report, such as a lack of transparency in airfares, annoyances like cramped seats and extra fees for almost everything, as examples of elements of airline travel that are wearing on travelers despite the performance improvements. The data show that the rate of airlines losing or damaging checked luggage, involuntarily bumping passengers from overbooked flights and of passengers filing complaints against airlines with the U.S. Department of Transportation dropped in 2017 from 2016. The only measure in this report by which airlines did worse last year than the year before was their on-time performance, and that dropped off only slightly, with 80 percent of flights arriving at their destinations on time in 2017 compared with 81 percent in 2016. The study's authors acknowledge that calling a drop in on-time performance "slight" is little comfort to those who are on the 1 in 5 flights that is canceled or delayed. So does that mean the experience of flying on a commercial airliner is getting better? "While it might be better in a standard performance way," says Airline Quality Rating report co-author Dean Headley, a professor at Wichita State University, "I'm not sure the flying public is going to notice that [improvement]." In other words, Headley answers with a twist on a catchy phrase, saying "airline travel is great again." "Now, you can follow that with a period, a question mark, or an exclamation point; [it] depends on what happened on your last flight." In the report, Alaska Airlines takes the top ranking for the second consecutive year, followed closely behind by Delta. JetBlue, Hawaiian, and Southwest round out the top five. Low-cost carriers Spirit and Frontier are at the bottom of the airline performance rankings. The airline quality reports show that three airlines that had been ranked near the bottom last year — United, American and Frontier — improved in every category. Those improvements lifted Frontier out of last place, but United and American remained in the eighth and ninth positions. One airline that had been ranked near the top, Virgin America, performed worse in every category, dropping it from third in 2016 to seventh. Collectively, Headley says it seems that for every step forward the airlines take, improving services in some areas, they then take another step back, frustrating passengers in other ways. "They do things to kind of help, but then they get the gun out and shoot themselves in the foot on the other end of the thing," Headley says. He points to things that aren't measured in this report, such as the ever-shrinking economy class seat, as airlines jam in more seats to pack more fare-paying bodies onto every plane. You can get more legroom, but you have to pay for it. Want to check your luggage? You likely have to pay for it. And while the rate of complaints is down, the leading cause of complaints remains the same year in and year out — flight problems, including delays, cancellations and schedule changes. "It's the idea that they've broken a promise" to get you to a certain place at a certain time, Headley says. "Our expectations have been lowered in flight travel," he adds, "and the airlines haven't done anything [to] ratchet that back up." Headley notes that United in particular stands out for cutting its rate of involuntarily bumping passengers in half last year, but it did so only after video of the bloodied passenger being dragged off a plane went viral. 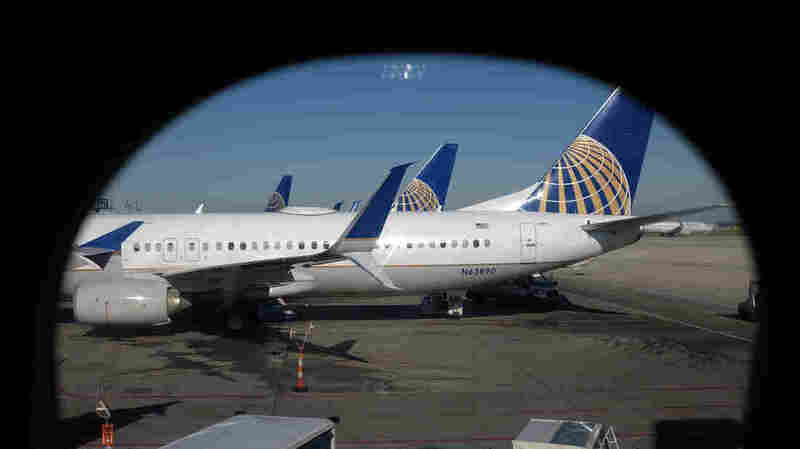 United is changing its policies and procedures for transporting animals, but only after several high-profile cases of mishandling pets, including one in which a dog placed in an overhead bin died. "I kind of get disappointed when it takes an incident, a very bad incident for the airlines to react and do something about it," Headley says. "Shouldn't they be thinking about this ahead of time if they care about customers and the customer experience?" Passenger advocates echo those frustrations. Kurt Ebenhoch of the group Air Travel Fairness notes that even though the bloodied passenger led to international outrage and prompted congressional hearings and demands for new legislation to hold airlines accountable, it resulted in little actual progress. "Not a single law changed; not a single regulation was passed," Ebenhoch says. "Nothing was done from a government perspective to prevent that from ever happening again." In fact, Ebenhoch says airlines are actively lobbying the Trump administration to further deregulate the industry, and he says the administration is "giving a green light" to such efforts and is "trying to take away just about every consumer protection that has been in place for an awfully long time." Ebenhoch notes that there wouldn't even have been this annual airline quality report, which is now in its 28th year, if the airlines weren't required to report their performance data. Henry Harteveldt, a travel-industry analyst in San Francisco, told The Associated Press that airlines "don't care about these reports because they don't have to care."